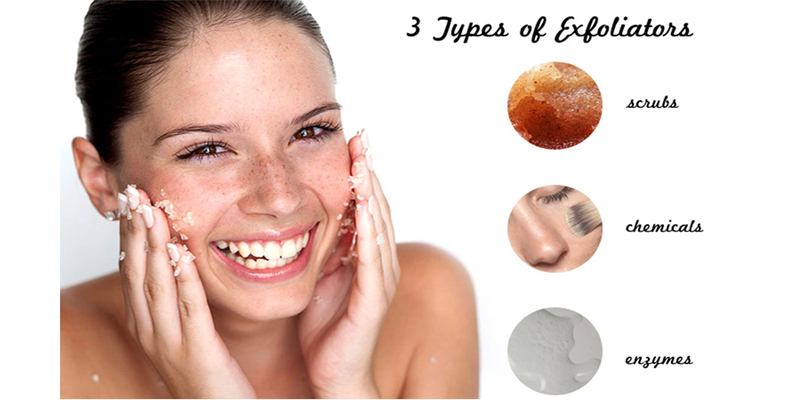 Hello and welcome to our blog on week 31 we are sharing Fall and winter Skin Care. We wish to thank you all for your consistent support. The dry air in winter, both indoors and out, with heaters and dry winds, takes a toll on skin, hair, and nails. Also, long showers and many hands washing a day, before you know it, the skin is rough, flaky, dehydrated, and itchy. Sometimes it even cracks and hurts. Your hands and face are the most exposed to the elements so they are the ones that deserve extra TLC in the winter. Keep skin healthy and moisturized, here are some TIPS to protect your skin. 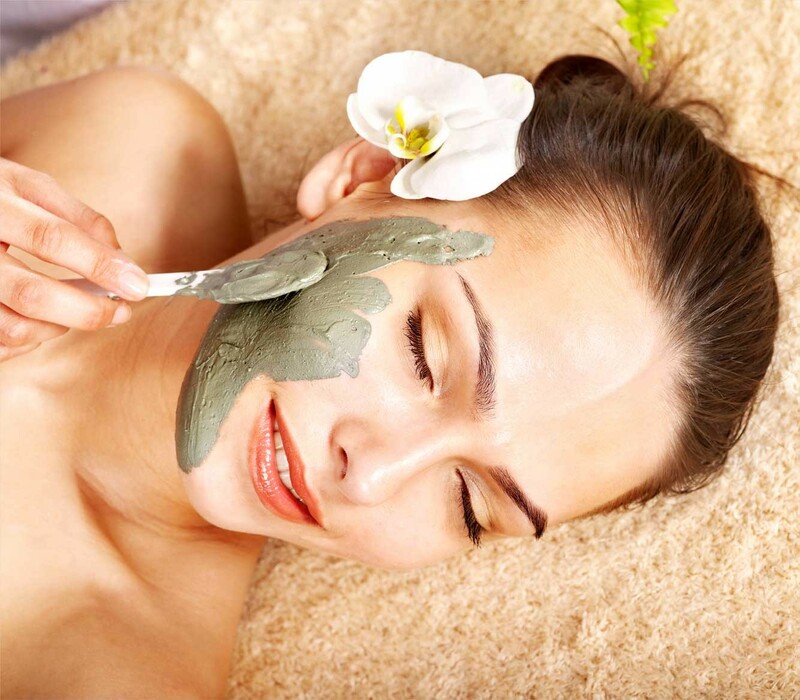 Yes, you still need to exfoliate in winter, as a matter of fact, you probably will take the time to pamper your self more in the colder months when is no so many outdoor activities. Use a gentle scrub or an exfoliating ingredient like milk (lactic acid) or sugar or salt scrubs, below we are sharing a few recipes to remove flaky excess skin cells. After exfoliating, generously apply a nourishing mask and follow with a moisturizer; you’ve broken down your skin’s barrier and emollients can absorb better this way. To keep lips smooth, brush them a couple of times a week with a soft toothbrush or scrub gently with brown sugar scrub with I prefer you can make your own and we will share a few recipes. Add moisture to your face, neck, hands, and your whole body, I like layering skincare I apply serum or oil then moisturizer and doing weekly hydrating masks. Many times I sleep with a gentle mask and Slather on a thick body butter, Coconut oil, or Shea Butter, the goal is to apply a Natural rich product after each shower or bath. And if your hands and feet have painful cracks, the best time to heal is overnight, you can do a mask on your feet and sleep with it on it, just place a pair of socks on it and Voila nice soft feet, I love to soak them first exfoliate and mask UHummmmm!. Apply a thick emollient to your hands also and wear gloves Is fabric Gloves that are specifically created for that so the moisture can absorb all night long. Long showers and baths strip skin of its natural protective oils. Our skin secretes oily substances that prevent it from drying out as well as protect skin from bacteria and dirt getting in. Add some soap and skin’s oil barrier is stripped away in no time. Limit time and the temperature of the water when taking a shower or bath limit the time to 15 minutes and go for warm water instead of hot water without those oils, the moisture in your skin easily escapes, leading to dry and itchy skin. The longer and hotter the shower, the faster this process takes place and the more moisture you’re likely to lose. If you can’t live without a long soak, add a generous helping of coconut oil or the oil of your preference to the water and a healthy amount to your skin after you are done pat dry the skin avoid rubbing. Switch to showering at night if possible so your body can replace its oils while you sleep, and here especially don’t use really hot water. Also, consider a product that contains ceramides. Ceramides help protect and retain the needed moisture for your skin. We tend to use the hottest water when washing dishes and those dish-washing detergents can be even harsher as they are designed to remove tough oily stains and solid fats. Using gloves is your best bet and a nice nourishing hand cream should always be at the sink. Went and dry especially with hot water will damage not only the skin on your hands but the nails contract and expand and they get dry and crackly. Dermatologist Sandy Johnson, M.D., says the American Academy of Dermatology recommends limiting your baths and showers to no more than 10 minutes to avoid dehydrating your skin since hot water removes your skin’s natural oils. Soap is drying to the skin and for the most part very Alkaline, Skin needs a be on the acid side. A PH of 5 up to 6 is preferable, soap strips away the natural oil barrier and many are filled with harsh chemicals and drying perfumes, and many ingredients that are not really compatible with the Skin health, I never use soap. I use scrubs and an exfoliating pad like the Korean ones, they are sold all over the Internet. Body Butters contain emollients and rich ingredients that cover the skin in a blanket of pure moisture that ultimately lasts longer than any lotions, it acts as a barrier so it helps to trap harsh environment intruders, a great aid in Fall and Winter. Do you know much about essential omega 3 fats? Body Butters contain this beneficial ingredient. These fats are of great benefit to your body internally and externally, aside from moisturizing they help control inflammation, Body Butters also contain key antioxidants like vitamin C, E, and A among many other great nutrients. Body Butters are the most efficient when applied to cracked skin, eczema etc, great for chapped lips, cracked heels, lets not leave cuticles out of the game,great to soften stretch marks, scars lets remember to use it after shaving also, in fall and winter I also use it as a makeup remover. 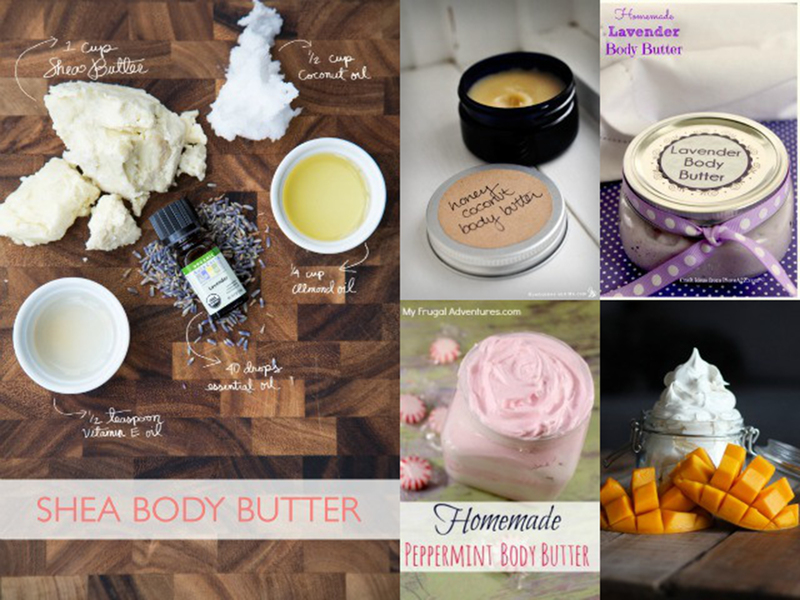 The biggest difference between most body butter recipes and common creams/lotions recipes are that body butter is composed of mostly of carrier oils and butter rather than the addition of an aqueous ingredient like water, hydrosols, aloe vera, etc. Another great plus about Body Butters is that are very AFFORDABLE, and last a long time, in a dark container away from extreme temperature changes. Two types of moisturizers are needed it to maintain healthy skin: humectant and lubricant. Humectants reduce the amounts of lost moisture that the skin naturally goes through especially in Fall and winter. Aside the added bonus is that Body Butters luxurious to the touch. The one point I like to make here is that by doing your own Body Butters you can add the fragrance of your choice and avoid synthetic ones that can create great health hazards and they contribute to dehydration and possible allergies. In a glass container like Pyrex create a double boiler, by placing water in a pan and placing your Pyrex container,avoid from getting your ingredients to hot, place your cocoa butter and use enough heat just to melt the butter, once that is done remove from the heat and add the sesame oil and the essential, always avoid to boil any of the ingredients, when done mixing pour it to a sanitized dark container the mixture will solidify and you can proceed to store it in a cool dark place to preserve its life. Melt the Cocoa Butter in a double boiler in a Pyrex bowl. Add in the Coconut Oil, stir well. Add the orange essential oil, stir well. Cover and allow to solidify. Once it is solidified beat it with a hand mixer until fluffy. Add the mixture to a sanitized jar preferably dark with a lid. Store out of the sunlight in a cool dark place. Use this as a shaving cream or as a prep before or during showering. Place shea nut oil, mango butter, and pomegranate seed oil into the top of a double boiler (a pyrex measuring bowl sitting above a pot of simmering water) make sure that it doesn’t boil use low heat. Heat on medium and stir until all the butter is melted together, leaving no chunks of butter behind. I like using a small silicone spatula. Once melted, turn off heat and add in the essential oil when it has cool down and you can still mix, otherwise the essential oil will dissipate, and vitamin E oil. Wait until it starts thickening, about 20-40 minutes., just leave it until it does. Using a hand-held mixer, whip up your oils and butter until you reach a nice consistency. 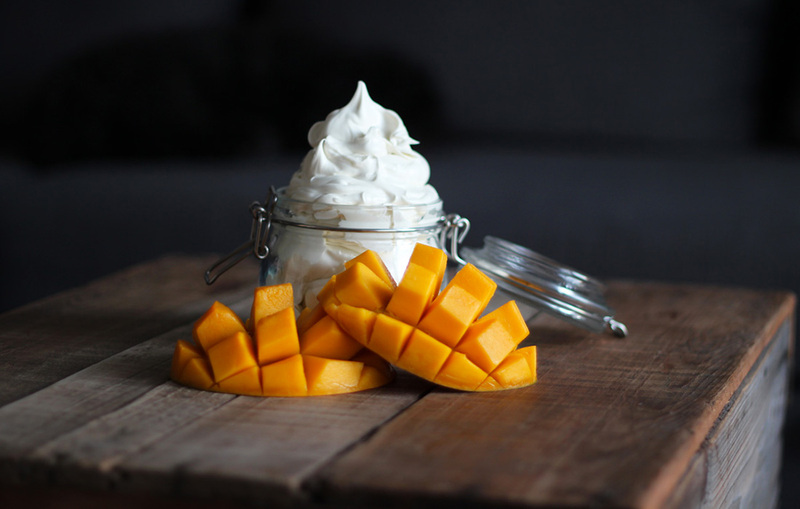 Once fluffy, scoop your whipped butter into sanitized containers preferably the kind that doesn’t allow light in, or place body butter in a plastic bag, clip the corner, and squeeze into a container of choice. 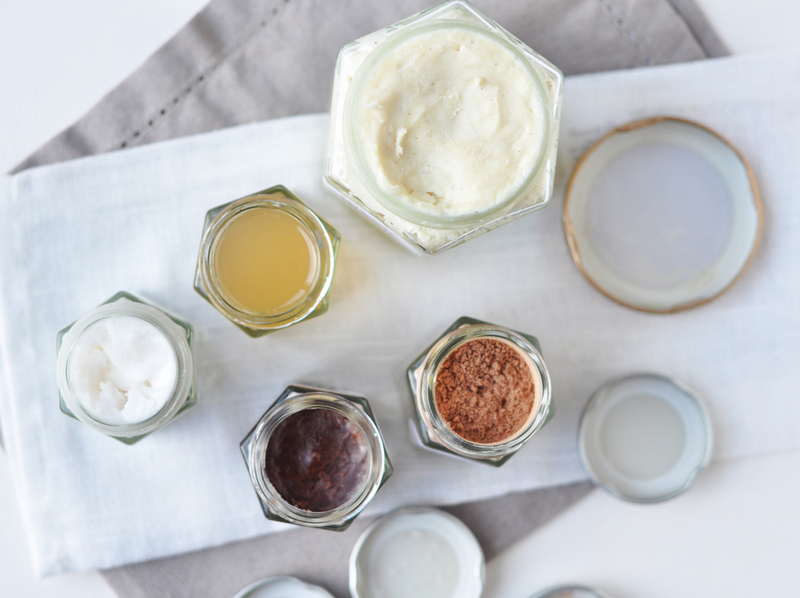 You can find a number of different containers that will hold your body butter perfectly. 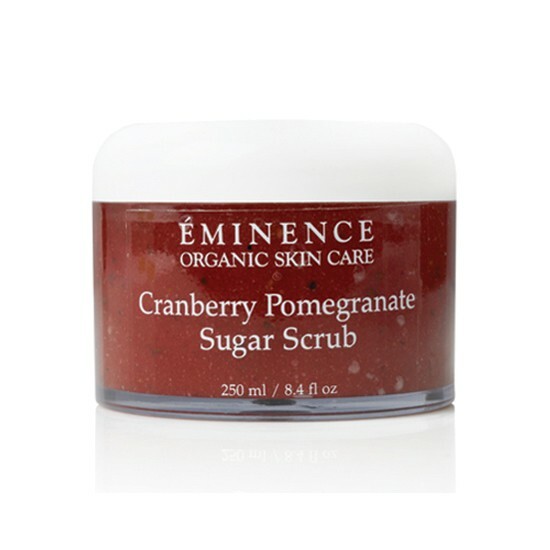 Eminence Organics Cranberry Pomegranate Sugar Scrub (8.4oz) works on multiple levels to improve the health and appearance of your skin. While gently exfoliating dead skin cells and other impurities, the powerful blend of botanicals infuses the skin with moisture, nutrients, antioxidants, anti-aging formulations, and brighteners to reveal a toned, even complexion with fewer wrinkles and a youthful glow. 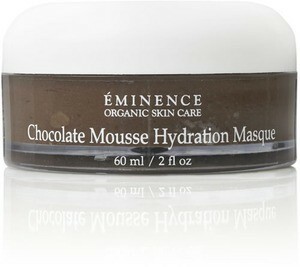 The Eminence Organics Chocolate Mousse Hydration Masque (2oz) is a relaxing, sensory experience and hydrating facial treatment in one. 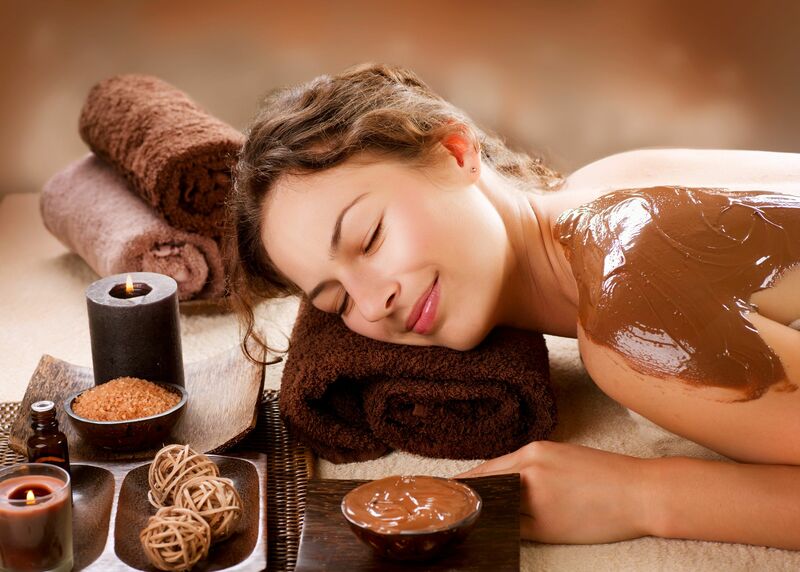 You’ll love the way the decadent chocolate overwhelms your senses while delivering to your skin the deep-moisture and vital nutrients it needs to look gorgeous. 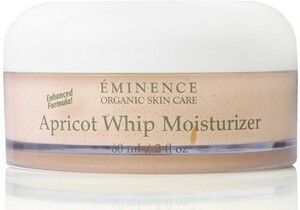 Revitalizing, hydrating and refreshing, Eminence Organics Apricot Whip Moisturizer infuses the skin with moisture and nourishes the skin with vitamins and antioxidants for powerful hydrating and anti-aging effects. Eminence Organics Mimosa Champagne Massage Oil is a luxurious way to give your skin a health-enhancing, beautifying experience. With ingredients that shower the skin with moisture and infuse it with antioxidants and vitamins, you’ll love the way your skin looks and feels when you massage it in.